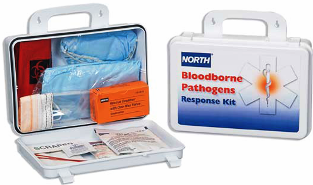 North Bloodborne Pathogen Response Kit with CPR 16 unit size, Plastic Kit - 019745-0032L contains the vital contents in the event of a bloodborne or body fluid mishap. It comes complete with the needed supplies when engaged in a situation to clean up a spill containing bloodborne pathogens. It also has the PPE such as a surgical mask, gown and shoe covers necessary to protect employees in accordance with OSHA 1910.130. The kit needed to refill this bloodborne kit is North Refill Kit # 127011. Vital 1 absorbent, 2 oz. Biohazard bag, 24" X 24"